And nights, bright days, when dreams do show thee me. It is no surprise that Britten's greatest achievements as a Schubert accompanist are when the music inhabits magical and mysterious realms, very often the world of sleep and dreams of which he was such an indefatigable explorer in his own music. Although there were live performances of Winterreise by Pears and Britten which were even more wonderful than the Decca recording, that disc remains an indispensable part of the duo's legacy. No-one has, in my opinion, invested such magic to the change from D minor to D major in the first song, Gute Nacht, where the traveller treads softly so as not to tread on his lover's dreams. Again to steal the words of Yeats, it is the songs 'of night and light and the half light' that Britten understands best: the reverie of Der Lindenbaum, the aching nostalgia of Frühlingstraum, and that great nocturne of bourgeois complacency versus the outsider's torment, Im Dorfe. As the last songs of the cycle progress to madness and recede from reality, Pears and Britten create a twilight atmosphere where the setting of the suns (Die Nebensonnen) is elevated to a symbol for the nightfall of the human spirit. There have been other great Schubert accompanists (Gerald Moore chief among them) who have served Schubert with the earthy reality, sanity and goodness which are also very much a part of the composer's make-up, but Britten explores the dark corners and the corridors of Schubert's music with an unique daring; the world of sleep was a dream of a gift to his illustrative abilities as both composer and performer. Why he needed to paint the secret realms of the unconscious is another more complicated matter—one that will be mulled over no doubt by the medical men and musicological sleuths who are interested in the psyches of great composers. It is certain that Britten himself had a good many dreams: he once told me that one of his recurring nightmares involved the loss of his school cap—a terrible calamity for an English prep school boy. It is also known that in one of his dreams he met Schubert in heaven, thanked him for his music, and received a charming but slightly bemused reply. It so happens that Schubert left us with a record of one of his dreams, a type of prose poem entitled Mein Traum which was written out in the composer's own hand, and dated 3 July 1822. In the dream the composer's father first invites his son to a pleasure banquet and demands that he enjoy the exquisite dishes; unable to do so, young Franz is banished. He returns home after having received news of his mother's death. His father then invites his son into his favourite garden, asks him if he likes it, and strikes Schubert when he admits to finding it repulsive. Reconciliation between father and son is only effected at the tomb of a pious virgin around whom move a magic circle of male initiates. Schubert wrote 'Divine thoughts constantly appeared to emanate in the form of spraying sparks from the virgin's tomb onto the young men. These sparks made a gentle sound'. The composer is welcomed into this circle, and his father, full of forgiveness and love, embraces his son. Jungian analysis of this dream (and here I am indebted to Eva Loewe) interprets the 'dead' virgin as a soul-figure or anima image, not of this earth and transfigured. Franz has chosen her as the celestial Venus, rather than the terrestrial pleasures proposed by his father. At the banquet he was offered nourishment from the masculine psyche which he refused (in all probability an initiation into the pleasures of heterosexuality) and the garden, too, is a symbol of masculine initiation which Franz is too disgusted (he uses the word widrig) to accept. We can only guess at what wound lies behind his grief and disgust; it seems to be a betrayal by the father. Franz yearns for a higher initiation, mythical and archetypal, in which he succeeds in uniting the father and son aspects of his psyche. The reconciliation is effected only through the magic circle of music emanating from the other-worldly virginal soul figure who has 'died'. At the tomb of the virgin he meets the archetypal Father, is embraced and forgiven, and loved. There is no doubt that the world of night was as important for Schubert as it was for Britten. It is true of course that German romantic poetry was much concerned with night, and that no composer of Lieder was able to avoid such poetry, but nocturnal challenges bring out the best in Schubert. 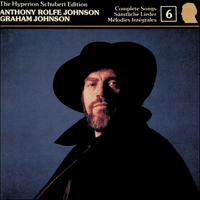 He commands an astonishing range of night styles, and this recital is the first of three in this series of discs which highlights (or perhaps more appropriately halflights) the composer's affinity for the world of night and dreams, and his ability to find infinite variety of mood and colour within the darker hours. We end this recital with the three Rochlitz songs which Schubert himself bound together as his Opus 81, a night-time anthology of three different types of serenade. Although there are no piano nocturnes as such from this indefatigable composer of Impromptus (the only piece bearing this title is an exquisite movement for piano trio, D897), there are a couple of dozen Schubert songs with the word Nacht, or Abend, on the title page, and many, many more which take place by night. This disc is an anthology which encompasses tender lullabies, thoughts on mortality, nocturnal serenades, a joyous nightride, an eventually successful assignation and so on. In the light of Schubert's dream the choice of Leitner's poem (Vor meiner Wiege) about his love for his mother (and his fear that she might die) and the Bauernfeld and Ottenwalt poems about a father's love (Der Vater mit dem Kind and Der Knabe in der Wiege) have a special significance. Perhaps what Britten and Schubert had in common was a sympathy for a time of day or a state of mind (for is the act of creation not partially a dream-like state?) when they could retreat from the labels and limitations placed on them by a basically hostile society. In Schubert's case his genius was constrained by poverty, lack of recognition, the triumph of philistinism in a politically illiberal state, and the limitations of his own body, such a poor, unromantic match for the raging furnace of passion and sexual energy which those who knew him well could perceive. He was, it seems, to quote another Shakespeare sonnet, 'In sleep a king, but waking no such matter'. Night overturns incontrovertible truths and it subverts the certainties of daylight. But it is not only ugly and slimy things that emerge at night, and not everything beautiful flourishes by the light of day: the lotus flower (immortalised in song by Heine and Schumann) comes out in moonlight, aspiring to the heavens and yet rooted beneath the water in mud and slime. The sheer range of experience for which this flower is a metaphor, shunning the obviously bright lights, nurtured by its murky roots, but inspiring us with the unearthly beauty of its flowering, is valid for many a great creative artist. Both Schubert and Britten had their dark sides, indeed they were happy in the dark where they might be themselves without the spotlight of sunny rationality which removes the mystery and the magic, and aids the critics' attempts to pinpoint the unpinpointable. I suspect that the constraints and difficulties experienced by Schubert in Vienna, his sympathy for a bohemian and liberal group of friends in the middle of a repressive age, would have found their echo in the life of the homosexual pacifist Britten living in England in the 1930s and '40s, and indeed much later. If Britten's dream was prophetic and it was true that Schubert and Britten met in heaven (as opposed to the hell that many of their contemporaries would have been all too ready to predict for them) I am not certain that they would have been very articulate in each other's company (celestial simultaneous translation services notwithstanding). But I am sure that their ideas of what makes up the music of the spheres would be remarkably in tune, and that their preferred corner of their eternal resting place would not be lit by a blaze of light, but gently illumined by the twinkling heavens to which they so often gave musical voice. In Schubert's dream the gentle rustling of sparks ('lichte Funken … welche sanftes Ger„usch erregten') emanating from 'das ewig Weibliche' is in fact the most sublime music and it is after all only the greatest composers who can create the sound of starlight.